ARS offers control valves for low flow OEM, laboratory instrumentation, or bench top flow control purposes. The valve designs and materials make them suitable for use with a variety of gases and fluids. 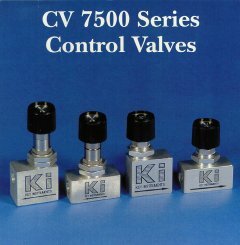 Complete valves are available in straight through or 90º angle body configurations and are constructed of brass or stainless steel. All valves are supplied with 1/8" FNPT inlet and outlet ports. The valve cartridge may also be integrally mounted in flowmeter assemblies. The economical cartridge valve (CVS) is available in three different needle tapers which cover our entire flow range. These units have a rising stem and provide ten turns from closed to full open. The non-rising stem precision control valve (CVP) is available in six different needle tapers, for fine control of very low flows. This valve offers sixteen turns from closed to full open. Its design eliminates saw-toothing and is virtually hysteresis free. All materials are matched for similar coefficients of expansion.